Enjoy More Than $500 In Savings At Participating Southern Arizona attractions. 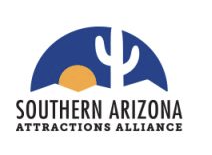 The Tucson Attractions Passport provides you with exclusive savings at the Southern Arizona attractions, tours, events and festivals. 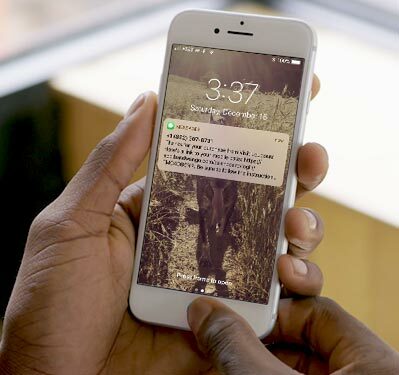 It's instantly delivered to your mobile device via text and email - there are no apps to download and you'll get all the information you need during your visit including hours of admission, phone numbers, maps, and directions. Purchase one today so you’re ready to go. The pass will begin on first redemption within 90 days after purchase at one of the participating attractions. See what's included in the passes! 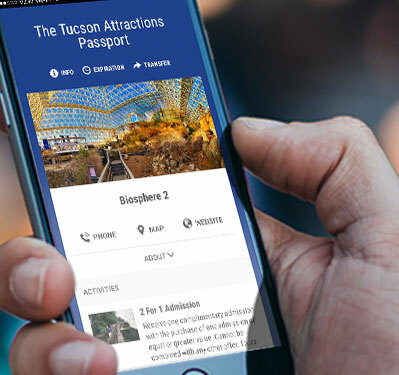 The Tucson Attractions Passport is a special collection of great deals and discounts to Southern Arizona area attractions. When visiting an attraction simply present your phone to redeem your discounts and special offers. A 2-For-1 Attractions Admission is defined as receiving one complimentary admission with the purchase of one admission of equal or greater value. Visit as many attractions during normal operating hours until your time runs out. The clock starts upon first use at one of the participating attractions. Performing and visual artists draw inspiration from their Sonoran Desert-borderland surroundings in Tucson. 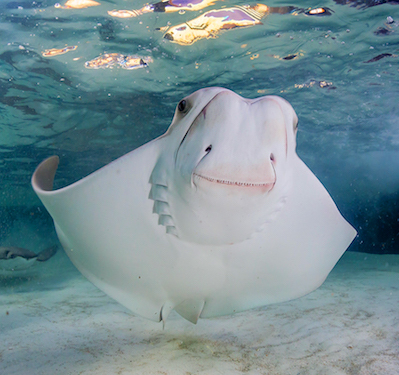 Receive one complimentary admission with the purchase of one admission of equal or greater value. As close to Broadway as you can get! Arizona Theatre Company is the Official State Theatre of Arizona. ATC presents world-class theatre in the historic Temple of Music & Art in down-town Tucson and at the Herberger Theater Center in downtown Phoenix. ATC is a member of the League of Regional Theatres and productions are acted, directed and designed by top professional theatre artists. STEP RIGHT UP and get ready to Laugh, Have Fun, and Celebrate a magical night out at the “Best Show in Tucson!” This close-up illusion show is “Revitalizing Magic” by blending an international travel themed night out with all the charm of a Vaudeville-inspired roadshow. Join the “Magic, Mystery and OOOH La La” for date nights, anniversaries, and special occasions. Explore this 10-acre foothills retreat to see the legendary art and architecture of acclaimed Arizona artist Ted DeGrazia. A national historic district, the adobe complex includes the gallery with permanent and rotating exhibits, gift shop, cactus courtyard, Mission in the Sun and artist’s former home. Originally opened in 1930, the Fox Tucson Theatre is known as the "Crown Jewel" of downtown Tucson and Southern Arizona's premier performance venue. The 1164-seat venue is big enough to attract national and international talent, yet small enough to boast an intimate audience atmosphere. The Fox Tucson Theatre is listed on the national historic register, and there's truly no better venue in Tucson to enjoy a concert, classic film, non-profit gala, speaker series, or other event. A premier university experience in an environment of musical excellence! Green Valley Recreation offers a rich and diverse performing arts series, GVR Live! From music to theatre, the series welcomes national and international artists who provide a variety of exciting entertainment to the Green Valley community of Southern Arizona. Receive 50% off one performance ticket with the purchase of a performance ticket of equal or greater value. An internationally renowned poetry library, the Poetry Center sponsors numerous University and community programs, including readings and lectures, classes and work-shops, discussion groups, symposia, writing residencies, poets-in-the-schools, poets-in-the-prisons, contests, exhibitions, and online resources, including standards-based poetry curricula. Experience Tucson through the colorful work of Diana Madaras--voted Tucson’s Best Visual Artist a record eight times. The Gallery features the largest collection of local paintings and Southwest gifts, and has be-come synonymous with Tucson. Also enjoy the paintings and crafts of 26 guest artists, including world-famous artist John Nieto. A favorite of residents and a must-see for all visitors. "The magic of this place cannot be over-stated." - Chicago Tribune. Featuring over 400 miniature houses and roomboxes expertly displayed. The Museum's permanent collection boasts antique dollhouses dating to 1742, contemporary fine-scale miniatures and enchanting collectibles. Frequent temporary exhibits, special programs, and events mean there is always something new to see. For a truly memorable experience, don't miss this one-of-a-kind collection in a world-class setting. Established by artists, MOCA is Tucson’s only museum devoted exclusively to contemporary art from Tucson and around the globe. MOCA is committed to thinking globally, acting locally, and engaging with the ethics and aesthetics of contemporary life. Through varied programs, MOCA is Tucson’s primary education resource for contemporary art and maintains a full exhibition, education, and artist-in-residence program. Built in 1920, the non-profit Rialto Theatre hosts more than 200 events and draws nearly 150,000 people annually to the heart of downtown Tucson. Named a Top 50 Major Club Venue worldwide by Pollstar magazine, the Rialto offers a wide array of quality live entertainment in a historic setting. With the award-winning Stevie Eller Dance Theatre as its home, UA Dance offers more than 40 concerts a year in Tucson featuring a signature blend of ballet, modern and jazz dance. The ensemble has performed in 14 countries across Europe, Asia and South America as well as the Kennedy Center in Washington, D.C. and the Joyce Theater in New York City. Our plays, while new to Tucson, have been critically acclaimed. Our venues are intimate, and we feature talk backs with the director and actors after each show. Since our audiences are important to us, we try to give them productions that are intellectually, emotionally and fiscally accessible. See you at the theatre! Make your own glass art, watch live glassblowing, or browse the gallery at Sonoran Glass School. Just minutes south of downtown, we invite you to Spark Your Creative Fire. SGS is a non-profit educational organization and the premiere center for glass art events and experiences in the Desert Southwest. The Tucson J's Sculpture Garden and Fine Arts Gallery feature the work of local, regional, and international artists. A convergence of art and audience encourages visitors to relax, converse, meditate and contemplate. The J is open to all! Receive one complimentary Arts & Culture Adult Class with the purchase of another Adult Class of equal or greater value. Tubac Center of the Arts is the core of art in Tubac. It is a nonprofit art center offering outstanding art exhibitions, workshops, special events, performing arts and a summer program for youth. The gift shop features jewelry, unique arts and crafts from regional artists. It is one of the few places in Tubac offering books and gifts for children. Come visit and enjoy! Free Admission. 10% off regularly priced merchandise in the gift shop. Tubac is a historic destination for the arts! Tubac features over 100 eclectic shops and world class galleries situated along meandering streets punctuated by hidden courtyards and sparkling fountains. Spend the day wandering amongst this wealth of painting, sculpture, ceramics and photography, as well as unique regional fashion, leather, crafts, antiques and jewelry. Our mission is to preserve, display and educate our guests about the arts and history of the Desert Southwest. At the core of the Museum is one of the Southwest's premier collections of Navajo and Hopi pre-1940s textiles. We also have a diverse range of historical artifacts and Southwestern paintings. Receive complimentary adult admission with the purchase of another admission of equal or greater value. The Tucson Improv Movement (TIM) is Tucson's fastest growing Improvisational Comedy Theater and Comedy School. From improvised rap battles and fast paced improv team competitions, to long form improvisation with entire shows inspired from just a single word, TIM offers a wide variety of shows for all audiences. The Tucson Museum of Art and Historic Block features permanent and feature exhibitions of Modern and Contemporary, Native American, American West, Latin American, pre-Columbian, European, and Asian art. The museum’s historic block of 19th and 20th C. adobe and Mission Revival-style buildings, encompassing a four-acre city block, includes the highly acclaimed museum restaurant Café a la C’Art, the Museum Store where you will find an impressive selection of works by Arizona’s most talented artists, and additional exhibition spaces. Receive one complimentary admission with the purchase of one general admission. The Tucson Symphony Orchestra serves Tucson and Southern Arizona with performances of the highest caliber through a series of Classic, SuperPops!, MasterWorks and Specials concerts as well as award winning education programs. The University of Arizona Museum of Art engages diverse audiences, inspires critical dialogue, and champions art as essential to our lives. The Museum’s permanent collection includes masterpieces that span eight centuries and innumerable artistic styles. Receive one complimentary admission with the purchase of one admission. No matter how many candles you had on your birthday cake, these Tucson attractions offer up a good time. Arizona Zipline Adventures is the ﬁrst and fastest Zipline EcoTour in Southern Arizona. Offering a variety of adrenaline pumping ziplines, team building activities, and fun for the whole family, it also serves as an event venue. Enjoy the views of the Galiuro Mountains and the San Pedro Valley, all while indulging in garden fresh, seasonal food from Peppersauce Kitchen. Play, learn and discover at Southern Arizona's only children's museum! Visit the Children's Museum Tucson for interactive exhibits, daily hands-on activities and monthly special events. Enjoy lots of art, culture and science exploration at the place where imagination and learning connect! Southern Arizona's only Professional soccer team is set to play in the brand new USL League 1. With an 8-month season from March to October, there will be no shortage of great games and goals to catch! Visit FCTucson.com for tickets and details. Opening home match is April 13 in the Kino Sports Complex, North Stadium. Come early, refreshments are available. Golf N’ Stuff Family Fun Center is open year round and proud to feature two 18-hole miniature golf courses, complete with whimsical scenes and beautiful water features. Enjoy our other great attractions to include zippy go-karts, wet n wild bumper boats with super soaker Squirt guns, hard and soft ball batting cages, and laser tag where "you are the game!" We offer the largest arcade in Southern Arizona inside our medieval castle with over 100 arcade games, and a complete snack bar. We proudly host Birthday Parties, Corporate events and large Group Outings. Call our Group Sales Coordinator at (520) 296-2366 x 13 for more information and reservations! Kino Sports Complex is the largest sports and entertainment venue in Pima County. The complex includes Kino Veterans Memorial Stadium (11,000 seats) and a regulation soccer stadium (3,000 seats). The complex is “the place to play” for sporting events, concerts and community activities. Kino Sports Complex is the home of FC Tucson, a semipro soccer team that plays in the Premier Development League May–July. Also catch pre-season MLS games Jan–Feb. Musselman Honda Circuit, located in the Sonoran desert is a replica of the world famous Suzuka Kart Circuit in Suzuka, Japan. Enjoy the thrill and excitement as you race around one of our rental go-kart tracks, we also teach beginner and advanced driving, riding and sailing schools and host corporate and group events of all sizes. Stay cool this summer at the Oro Valley Aquatic Center! Our facility features: interactive splash pad, giant water slide, four diving boards, 25-yard recreation pool, Olympic-sized pool, classroom for parties, meetings and classes, family changing rooms, concession stand, shaded bleachers. Pool is heated and open year-round. Ask about membership options! Tucson’s largest event, April 18-28, for the entire family features a carnival, concerts, petting zoo, equestrian events, hundreds of exhibits, Rodeo, a variety of tasty food and more! Be part of the action for three parties in the Rillito Park Horse Track Clubhouse for this year’s Triple Crown series: the Kentucky Derby, Preakness Stakes and Belmont Stakes. You can bet on racehorses vying to be the next Triple Crown Champion. Tucson Speedway is the Arizona NASCAR Home Track. We provide exciting asphalt stock car racing 10 months of the year. Our race drivers are nationally ranked by a point's system. Each race night has an additional attraction such as monster trucks, a trailer race or demolition derby. We are the value family entertainment location in Arizona! Explore the official campus bookstore, your source for everything from Arizona Wildcats gear, tech devices and accessories, course materials, and best-selling books, to book signings, storytime for kids, and special events. As a university-owned and operated store, purchases support student success through scholarships, student clubs funding, student employment, and more! Free Admission and 10% off one insignia item. YOUR ADVENTURE BEGINS HERE Enhance your campus experience by planning ahead. Do you have a full day to spend? Or a couple of hours? Let us know your interests and we’ll be happy to help you plan your itinerary, which may include our highly interactive tours. Trail Dust Town has been home to Pinnacle Peak Steakhouse for over 55 years. Family-friendly attractions include Wild West Stunt Shows (Wed-Sun at 7pm & 8pm), train carousel, Ferris wheel, gold panning, Museum Of The Horse Soldier, gift shops, haunts, Polly Anna Park parties, and more! 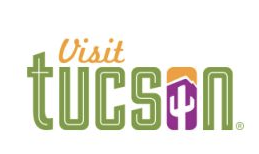 When visiting Tucson, everyone’s first stop should be the Visitor Center, located inside the University of Arizona Visitor Center building on the northwest corner of Euclid Avenue and University Boulevard. We have a variety of maps, brochures and detailed information about Southern Arizona. Family owned Dude Ranch in the Tucson Mountains. Day-time Adventure activities open to the public, including Horse-back riding, rock climbing, fat-tire biking, and shooting provide fun for the whole family. Buy One Adventure Activity and Receive the second same Adventure Activity for Free. Native American culture meets Mexican and Spanish colonial history. Set among the spectacular rock formations of Texas Canyon, the Amerind Museum, established in 1937, houses one of the finest collections of historic and prehispanic artifacts from Indigenous cultures in the Americas. The museum includes an art gallery, museum store, and picnic area. Explore Southern Arizona history from Span-ish Colonial times through territorial days. Exhibit topics include mining, transportation, Geronimo, 1870s Tucson, Arizona Treasures and uncovering Tucson’s past. The store fea-tures items such as Navajo and Zuni jewelry and reproductions of historic photographs. Explore Southern Arizona history from Spanish Colonial times through territorial days. Exhibit topics include mining, transportation, Geronimo, 1870s Tucson, Arizona Treasures and uncovering Tucson’s past. The store features items such as Navajo and Zuni jewelry and reproductions of historic photographs. Discover History--Explore Bisbee’s Past Today! The copper-mining heritage of Bisbee, a town with a history deserving national land-mark status, is captured in this one-of-a-kind museum. Featured exhibits include “Bisbee: Urban Outpost on the Frontier” (the story of the hard-rock miners and their families carv-ing a living out of rock) and Smithsonian-designed “Digging in: Bisbee’s Mineral Heritage” (the story of copper from a Bisbee point of view). "Your One Stop Fund Stop!" Bisbee Tour Company offers a wide-range of services including customized golf-cart tours of the city, shuttle, e-bike rentals, hotel/lodging accommodations, local gifts and more. Welcome to the Boothill Gift Shop & Graveyard in Tombstone, Arizona! Because of the many violent deaths of the early days, the cemetery became known as Boothill Graveyard. Buried here are outlaws, suicides and hangings--legal or otherwise--along with the hardy citizens of Tombstone’s early days. Make sure to stop by the Boothill Graveyard Gift Shop to pick up a souvenir of your historical adventure! Cocoraque Ranch is a century-old working cattle ranch that was homesteaded in the 1800s. Located within the Ironwood Forest National Monument, it’s listed on the National Register of Historic Places for ancient petroglyphs created more than 2,000 years ago. Ride horseback across the historic ranch. Breathtaking terrain, culture, flora and fauna await you. Located in the heart of Downtown Tucson, this museum depicts the development of early Tucson businesses, homes, and people. Exhibits include: John Dillinger, early police and fire departments, and the Romero barbershop. Fort Lowell Museum consists of reconstructed officer’s quarters from a military post that was active from 1873 to 1891. Learn about the history of the fort, its soldiers and their families, as well as the story of the Apache Wars, an eventful time of the American expansion and Apache resistance. Receive one free candle dipping or soap making activity with the purchase of another activity of equal or greater value. In 2019 the most iconic locale in Tucson celebrates its centennial year! The Hotel Congress has evolved throughout the past century into the cultural hub of the southwest. With the award-winning Cup Café restau-rant, acclaimed Club Congress music venue, and 40 classically renovated hotel rooms, Congress has something for everyone, and everyone has a Congress story, come create yours! Free admission. Receive one complementary tour with the purchase of another tour. The Jewish History Museum, a landmark in downtown Tucson, is a living museum where Jewish life, learning, culture and memory flourish. The Jewish History Building preserves and presents over 150 years of Jewish History in southern Arizona within the first Jewish temple in the Arizona Territory [est. 1910]. The Holocaust History Center is an educational institute dedicated to an ongoing examination of the Holocaust through the lived experiences of individuals who survived the war and later lived in southern Arizona plus an exhibit space dedicated to illuminating the contemporary human rights issues. Welcome to the Jim Click Hall of Champions at the University of Arizona. We are located on the north side of McKale and operate as an athletics heritage museum as well as a special event space. As you arrive, you will be greeted by our newly installed Lute Ol-son statue near our main entrance off the Eddie Lynch Pavilion. Come and see our displays of over 100 years of outstanding student-athlete performances, traditions, events and spirit. Rotating exhibits feature both current and historic moments in UA sports and legendary student-athletes and coaches. Founded by Spanish Jesuit Priest Eusebio Kino, this historic church remains an active Franciscan mission located in the San Xavier District of the Tohono O’odham Nation. The building of this spectacular example of Mexican Baroque architecture began in 1783 and work continued for 14 years before funds ran out. Often referred to as the “White Dove of the Desert” the building is currently undergoing careful restoration. The site, one of the most photographed locations in Tucson, is considered a “must see” in Southern Arizona. Free, docent led tours are offered Monday through Saturdays: 9:30am–12:30pm. A unique gift shop offers religious as well as Native crafts. Special celebrations are held throughout the year. Please check website for upcoming events and mass schedules. Step back in time at southern Arizona's one-of-a-kind Wild West attraction! Live action stunt shows, musicals, rides, tours highlighting our film history and more offer something for western fans of all ages. Great BBQ and other eats, shopping and lots of family fun make this a must visit experience! Enter the fascinating world of postal history and postage stamps at the Postal History Foundation -- one of Tucson's unique small museums. Free tours include 1800s postal station museum, special exhibits, research library, gift and sales departments, youth program and full-service working post office. Fun, educational activities for visitors of all ages! Experience colonial life on docent-led tours at this replica of Tucson’s original fort. The museum is located on the northeast corner of the original Presidio, built in 1775, and also includes an original pre-Arizona-Statehood Sonoran row house and an excavated Native American pit house. Living History Days are held on the second Saturday of the month October through April. Southern Arizona Transportation Museum is located on the former Southern Pacific Depot (now Amtrak) site. The Railroad oriented Museum offers: bilingual exhibits, art, artifacts, depot site tours, educational information, reference library, gift shop, party venue and an experience inside the cab of the locomotive filmed in the movie Oklahoma. The Cultural Center and Museum opened in 2007 to preserve Tohono O’odham culture for a better understanding of the Nation’s heritage and natural environments. It is located 10 miles south of Sells. Everybody is welcome. Get a glimpse of the true Old West at Tombstone Courthouse State Historic Park. Built in 1882, the two-story Victorian structure once housed the sheriff's office, jail and courtrooms of Cochise County. Today, the courthouse is a museum filled with exhibits that portray the authentic history of Tombstone as a frontier silver mining boomtown. A replica of the gallows in the courtyard represents where seven men were hanged. For more information visit AZStateParks.com. The Tombstone Epitaph, the Old West's most famous newspaper, was founded on May 1, 1880, by Wyatt Earp's lifelong friend, John P. Clum. Visitors to The Epitaph's free museum can read original reports on the historic Gun-fight at the O.K. Corral®, the shooting of Virgil Earp, Tombstone's Great Fire and much more. Come tour the historic print shop, which includes an original 1880s hand press and other equipment dating to The Epitaph's earliest days. The perfect gift or souvenir, The Epitaph, published monthly, is still full of fascinating articles on the winning of the West. Subscribe online to Arizona's oldest continuously published paper at tombstoneepitaph.com. Dedicated to preserving and enhancing tourism and family friendly events in the Historic Town of Tombstone. Be entertained and educated on your next visit! Two thousand fascinating years of history! We showcase Native American, Spanish, Mexican, Pioneer American and Arizonian cultures with award winning artifacts and displays to bring those 2,000 years of history to life in our interactive museum. See Arizona’s first printing press, our original 1885 schoolhouse, art gallery, ruins of the 1752 Presidio, gardens, wagons and much more. Tubac Presidio also serves as the trailhead for a 4.5 mile section of the Juan Bautista de Anza National Historic Trail- perfect for hikers, birders, and nature lovers. For more information, visit www.tubacpresidio.org. Visit Tucson as it was in the late 1800s as you stroll the four display buildings with over 125 horse-drawn carriages and daily work wagons. The hangar building is from when the rodeo grounds were America’s first municipally owned airport. Our large scale model train display takes you to 1880, and our farm equipment is from the same era. AND THERE IS MUCH MORE! All reasons why the Antiques Roadshow featured our Museum in its telecast. Tumacácori National Historical Park protects the remains of three Spanish missions to the O’odham people. Two of the mission sites can be visited only on special reserved tours during winter months; the Tumacácori Mission is open every day but Christmas and Thanksgiving. The park offers a visitor center, museum, book and gift store, orientation video, self-guided tour of the mission church and grounds, and walking trails. Guided tours and historic craft demonstrations are available seasonally. Special Collections is the place to discover the lands, the people and the history of Arizona and the borderlands. Explore amazing archives including maps, rare books, photographs, artwork, manuscripts, bilingual materials, letters and unique collections. Visit our exhibits, attend our free events, do some research and follow us at #UAZSpecColl. Venture off the beaten path and discover the natural surroundings that make Tucson and southern Arizona famous. Step back in time at the historical plaza and railway depot. Adventure awaits with plentiful outdoor activities year-round golf, hiking, bicycling, birdwatching, festivals and events. Nestled within the lushest desert on Earth, explore the Sonoran Desert region along a two-mile walking trail featuring the chance to be touched by stingrays, wolves, roadrunners, javelinas, arachnids, venomous lizards, snakes, and more than 230 additional native species. Iconic saguaros, cactus gardens, live animal presentations, walk-through hummingbird aviary, cave, aquarium and art gallery make the visit unforgettable. Follow us on social media with #desertmuseum. Be sure to visit our newest attraction: PACKRAT PLAYHOUSE! Purchase one Adult General Admission ticket and receive one complimentary Child ticket (3-12). Catalina State Park sits at the base of the majestic Santa Catalina Mountains. It is a haven for wildlife and desert plants including nearly 5,000 saguaros. The 5,500 acres of foothills, canyons and streams invite camping, hiking, horseback riding, picnicking and bird watching. The park provides miles of equestrian, birding, hiking, and biking trails, which wind through the park and into the Coronado National Forest at elevations near 3,000 feet. The park is located within minutes of the Tucson metropolitan area. For more than 1,000 years people have lived, worked, explored, hid out in or just enjoyed this beautiful desert area. On the National Historic Register, the park showcases crystal-ﬁlled Colossal Cave and historic La Posta Quemada Ranch. Spend the day: tour the cave, picnic, hike, take a real Western trail ride and treat yourself with food and beverages from the Terrace Cafe! Receive 50% Off One Admission With The Purchase Of An Admission Of Equal Or Greater Value. Some restrictions apply. Tucson's natural history museum highlights more than 400 different species of insects, mammals and birds from around the globe. Dioramas depicting wild animals in their natural settings promote wildlife appreciation and conservation. Hands-on displays, interactive exhibits and wildlife films provide fun and educational experiences for all ages. Mt. Lemmon Ski Valley boasts majestic pine, fir and aspen forests just 30 miles from Tucson and 30 degrees cooler. At 9,154 feet, the sky ride offers panoramic views of forest, rocky cliffs, desert floor and distant mountain ranges. Check out the gift shop, homemade fudge and the world famous chili and corn-bread at the Iron Door Restaurant. Treat yourself to a delicious pie - made fresh daily. Receive one complimentary Skyride with the purchase of a Skyride of equal or greater value. A window into the people, places, and histories of this region. Authentic, handmade American Indian and Mexican crafts, plus books, food, apparel, and more. The National Parks Store is operated by Western National Parks Association, a nonprofit education partner of the National Park Service since 1938. Your tax-free purchases help us support more than 70 national parks across the West. Oracle State Park is a 4,000-acre wildlife refuge in the northern foothills of the Catalina Mountains. Visitors can enjoy more than 15 miles of hiking, biking and equestrian trails at the park, including a section of the Arizona Trail, which crosses through the park. During the day, observe the abundant wildlife and visit the Kannally Ranch House to learn about the area. Stay after dark to experience breathtaking views of the night sky. Oracle is a designated International Dark Sky Park. For more information, visit AZStateParks.com. Tucked away in the rolling hills of southeastern Arizona, Patagonia Lake State Park is an ideal place for watching wildlife, fishing, hiking, picnicking, water-skiing and camping. The campground overlooks a 265-acre man-made lake where anglers catch bass, bluegill, crappie and catfish. Hikers can stroll along the beautiful creek trail and see birds such as the canyon towhee, Inca dove, vermilion fly-catcher, black vulture and several species of hummingbirds. Online camping reservations are available at AZStateParks.com or (877) MY-PARKS. Visitors traveling along I-10 between Phoenix and Tucson can’t miss the prominent 1,500-foot peak at Picacho Peak State Park. The trails are steep and challenging but take you through saguaros, chollas and ocotillos that dot the desert landscape. In the spring, you may see a magnificent abundance of wildflowers including gold poppies. Online camping reservations are available at AZStateParks.com or (520) 586-2283, from 8 am to 5 pm MST. There is a $5 non-refundable reservation fee per site. 50% discount on day-use fee. Nothing Gets You Closer! Explore naturalistic habitats housing exotic animals from around the world, including up-close views of tigers, anteaters, lions, flamingos, grizzly bears, elephants, rhinos, and more! You can feed a giraffe, ride the Cox Wildlife Carousel, meet an animal ambassador, or even schedule a behind- the-scenes tour. Through quality animal care, education and conservation partnerships around the world, Reid Park Zoo saves wild animals and wild places. By visiting Reid Park Zoo, you are helping too. At Roper Lake State Park, enjoy a natural hot springs, desert vegetation, five miles of trails in the park and at nearby Dankworth Pond. The park’s campground has stunning views of Mount Graham and the camping cabins offer an easy, fun camping experience. The accessible fishing dock is stocked with large mouth bass and rainbow trout, making it a great place for kids to catch their first fish. Online camping reservations are available at AZStateParks.com or (877) MY-PARKS. Tucson, Arizona is home to the nation’s largest cacti. The giant saguaro is the universal symbol of the American west. These majestic plants, found only in a small portion of the United States, are protected by Saguaro National Park, to the east and west of the modern city of Tucson. Here you have a chance to hike, bike, drive or enjoy a sunset among 2 million enormous cacti, silhouetted by the beauty of a magnificent desert sunset. To learn more and join Friends of Saguaro visit friendsofsaguaro.org. 15% off one item in the National Park Store located inside the visitor centers. One of the 10 great botanical gardens in the world, as named by Travel + Leisure. Set on 49 acres, Tohono Chul has something for everyone. Explore all the Sonoran Desert has to offer in easy-to-traverse botanical gardens and nature trails, including several distinct habitats of the region. Be inspired by local artists in the art galleries and museum shops. Relax on the Garden Bistro’s hummingbird patio, also home to a kaleidoscope of native butterflies, while enjoying freshly made local foods and a prickly pear margarita. Receive one complimentary admission to the park with the purchase of one admission of equal or greater value. The University of Arizona Campus Arboretum is a living laboratory promoting stewardship and conservation of urban trees through research, education, and outreach. Explore the oldest continually maintained public green space in Arizona. Repeatedly recognized as a Tree Campus USA and among the top University arboreta in the country. Learn what we’ve discovered about successful desert landscapes from more than 100 years of research. Join a scheduled guided tour with an expert September-May (RSVP required) or learn on your own time using a printed or mobile self-guided tours any time of the year. Few places in Arizona will offer you a tour of a fully operational mine. Experience the adventure of standing at the edge of the open pit and walking into the mill to see how ore turns into copper! Visit the theater, the huge out-door equipment and the beautiful gift shop. One of the 50 must-see wonders of the world! 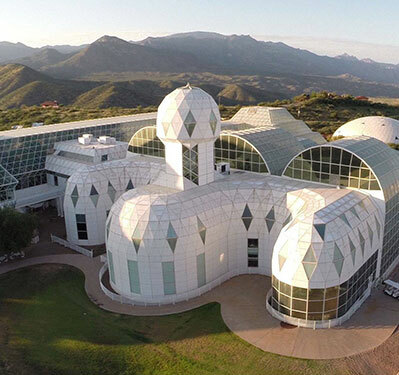 Come experience Biosphere 2 and ﬁnd out why Time Life Books named it a must see. Tours take you inside to explore future life on our planet. Flandrau Science Center & Planetarium in-spires visitors of all ages with the wonders of science. Located on the University of Arizona campus, Flandrau offers state-of-the-art planetarium shows, hands-on science exhibits, and the dazzling specimens of the UA Mineral Museum. Come enjoy fun science for the whole family! Receive one complimentary admission with the purchase of another admission of equal or greater value. Kitt Peak hosts one of the largest collections of telescopes in the world atop a beautiful mountaintop 56 miles southwest of Tucson. Enjoy daytime guided tours, scenic views, exhibits, and the gift shop. After dark, four different stargazing programs are available to meet every interest. The UA Laboratory of Tree-Ring Research is recognized worldwide as a preeminent center for dendrochronology, where tree rings are natural chronometers and recorders of change in the environment with which human society is inescapably linked. The Laboratory makes significant contributions to under-standing natural environmental variability. We offer free docent-led tours of our labo-ratory, where visitors learn about the Lab’s rich history, the tenets of dendrochronology, and view a variety of tree-ring samples in the laboratory spaces. The mission of Mt. Lemmon SkyCenter is to engage people of all ages in the process of scientific exploration by using the local “Sky Island” environment to merge a wide variety of science and engineering disciplines, thereby fostering a deeper understanding of Earth in the Universe. Attend our Premier StarGazing program and receive complimentary admission to the Richard F. Caris Mirror Lab. The College of Optical Sciences is proud to offer access to its collection of antique and historic telescopes, microscopes, lenses and cameras. These specimens represent work by the world’s most respected instrument makers from the 18th century to the present. Guests are welcome to come in for self-guided tours any time during regular business hours. The UA History of Pharmacy Museum is home to a world-class collection of pharmaceutical antiques. Housed in the UA College of Pharmacy, the museum invites visitors to experience exhibits such as a full-scale replica of a 1920’s drugstore and the collection from the Upjohn Pharmacy in Disneyland. Only place in the world to see how the largest and most complex telescope mirrors are pro-duced! This is a unique opportunity to learn how UA’s innovative engineering and optical technology are producing the next genera-tion of giant telescopes which will revolution-ize astronomy. These telescopes will explore deep into the universe and produce cutting-edge scientiﬁc research. The UA Astronomy department is ranked #1 in the USA, come see one of the reasons why! The Space Imagery Center in the University of Arizona’s Lunar and Planetary Laboratory (LPL) is a NASA Regional Planetary Image Facility started in the 1970’s to give the public access to images from NASA missions. The facility houses archive materials from Apollo, Viking, Magellan and other missions. LPL has been involved in NASA missions since the first robotic mission to the moon, Ranger, and now leads the OSIRIS-REx mission, which will collect and return a sample from asteroid Bennu. A National Historic Landmark, Tumamoc Hill is a living laboratory and one of Tucson’s natural gems. With over 100 years of pioneering science and over 4,000 years of human history, come experience the beauty and richness of the Sonoran Desert. Sure, we all love a spa day, but sometimes, retail therapy is needed. Our retail destinations are set in beautiful surroundings often with some of the most delicious food just around the corner. Nestled in the Catalina Foothills and minutes from major resorts, La Encantada offers enchanted shopping and dinning experiences. Hacienda-style architecture and courtyards are lined with 60+ exclusive shops -- including Anthropologie, Apple Store, Kate Spade New York, Lush, Brooks Brothers, Tiffany & Co., Crate & Barrel, Louis Vuitton, Lululemon, and Tommy Bahama, plus many local one-of- a-kind stores. Discover flavor, style and attitude when you visit Main Gate Square, a pedestrian-friendly dining and shopping destination featuring more than 20 retailers and 30 restaurants near the UofA attractions. Spend the day. Enjoy the night.